When it came to designing the look and feel of Relish, our new space next door to The Hardware Store, I knew what I wanted. Ocean, our trustworthy employee and woodworker, found a cherry tree on a property here on the island. In fact, he found another cherry tree on that property years ago, which he used to create the bar for the restaurant. We bought the cherry and had it milled. Then Ocean created the shelves and the work tables for our upcoming classes out of that one cherry tree. I wanted to have iron legs for the tables. One night, Ocean found some discarded plumbing pipes behind a dumpster. He got a threading machine, cleaned them up, and painted them. Now they are the legs of the tables and the structure for our shelves. They’re gorgeous! Want to stay up to date on our events? Join our newsletter! 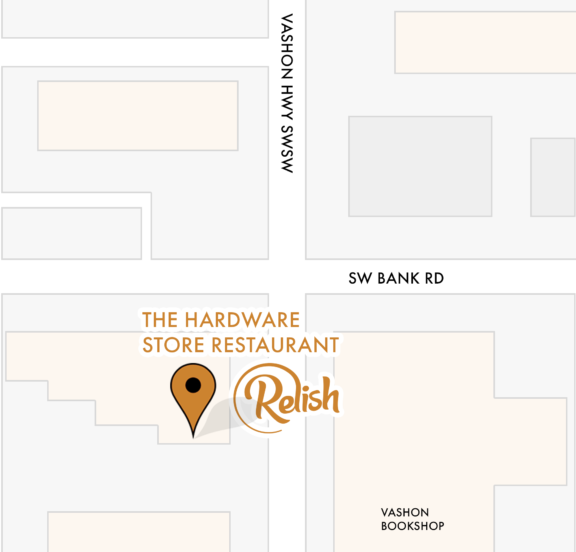 Relish is your place to gather, cook, eat, and enjoy. We would love to have you join us. Made in the Puget Sound.